Wiz Khalifa might have gone silent in his war with Kanye West, but Amber Rose is firing back with a shot ... right up the ole wazoo. 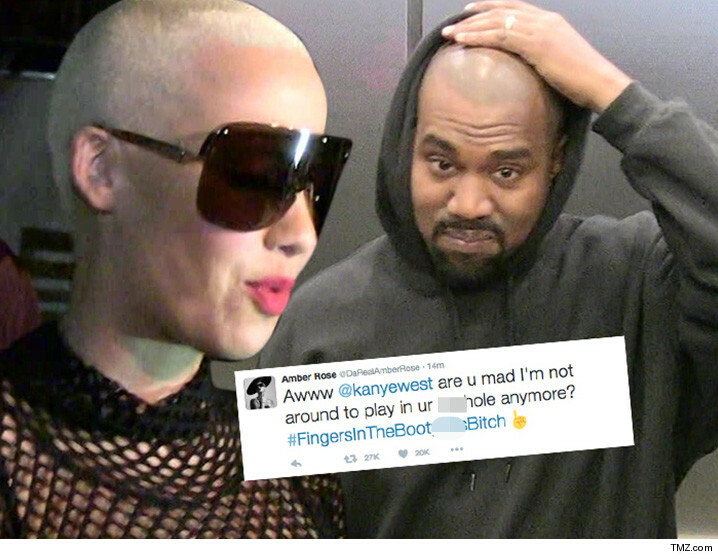 Amber clearly watched the Twitter war erupt, then decided to clap back at Yeezy -- "are u mad I'm not around to play in ur a**hole anymore? #FingersInTheBootyAssBitch"
Her coup de grace ... the index finger emoji. Awesome. Kanye's since scrubbed the nastiest of his shots at Wiz, and Amber noticed -- "Now you wanna delete your tweets cuz Muva has arrived? #TwitterFingers#UrGettingBodiedByAStripperN***a"
We'll say this, Kanye got personal first, by dragging Wiz and Amber's son into the beef. Amber just made it way more personal ... and revealing.